So this is more "assembly instructions" than a recipe but i wanted to share it anyway. Quinoa bowls are a great way to fill up your tum while still staying healthy and easy to customize for any picky eaters. This is a really quick meal you can make for one or for the whole family. As long as you can agree on a grain (or seed, technically for the quinoa) and a green... the toppings can be customized easily. 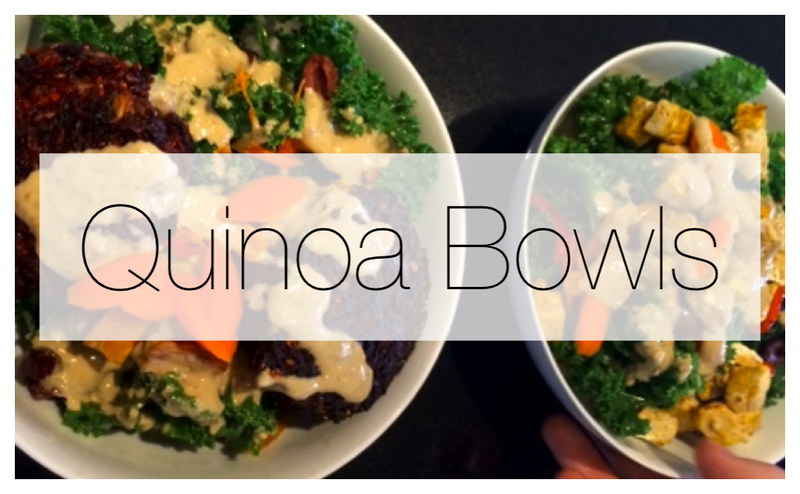 Its a great way to use up veggies, too... i've even had these bowls in cafes where they add a cup of their soup of the day onto the quinoa before adding the rest! Its also a great one to pack for school/ work as long as you keep the dressing separate until you need it. If you really prefer the quinoa warm like me you can even separate the quinoa and the salad (either in separate boxes or with the kale and toppings in a ziploc) so you can microwave the quinoa and reassemble it.